I am writing from Ottawa after attending the board meeting of Chronic Disease Prevention Alliance of Canada (CDPAC). I learned that men and women are still not making healthy eating choices. 30 % of Canadian’s daily calorie intake is food that is high in fat, sugar and salt. The statistics around men’s health in Canada are alarming, yet 70% of men’s health conditions/diseases are preventable. Obesity is strongly linked to type 2 diabetes, high blood pressure, heart disease, stroke, arthritis and cancer. 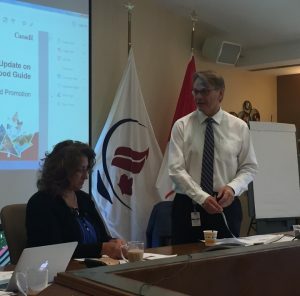 Health Canada is conducting a review of Canada’s Food Guide after The Standing Senate Committee on Social Affairs, Science and Technology launched a National Campaign to Combat Obesity. The report issued earlier this year titled Obesity in Canada with 21 recommendations for dealing with Canada’s obesity crisis. Photo above: Hasan Hutchinson, Director General of the Office of Nutrition Policy and Promotion within the Health Products and Food Branch of Health Canada, speaking in Ottawa about the Canadian Food Guide. The Canadian Men’s Health Foundation (CMHF) was created to inspire men to live healthier lives. It is one of the only organizations in Canada that focuses entirely on motivating men to develop and maintain key healthy habits, such as proper nutrition and physical activity, to prevent chronic health problems. Canada has some of the highest obesity rates in the world. Men living with obesity need support in managing and controlling their weight and there is a real need in Canada to provide men with effective health messages that they will truly hear, absorb, and act on. These days, it’s hard to wade through what’s fact and what’s fiction when it comes to nutritional advice and what you should be eating. Taking your health seriously is not a sign of weakness, it is a sign of courage. The DontChangeMuch.ca website provides tips, information and resources for men to help them improve their lifestyles and health, as well as to assess their health risks. The One Fat You Should Avoid at All Costs and 5 Healthy Food Swaps for Guys provide good advice to manage your weight. According to a study in The Lancet, not only is obesity increasing, but no national success stories have been reported in the past 33 years. Get a snap shot of your current and future health by going to YouCheck.ca. In less than 10-minutes you will be asked 18 questions and be provided a customized report with tips to improve healthy lifestyle choices. I congratulate Health Canada’s on its review of the Canadian Food Guide. Wayne Hartrick is the President of The Canadian Men’s Health Foundation.